Cruising down the road in a vehicle restored by hand is every car enthusiast’s dream. For some, that dream is out of reach because of the hobby’s costs. However, by buying used cars at a salvage auction, living that dream doesn’t have to leave you frustrated, pressed for time and flat broke. Whether you want to completely restore a vehicle or find a classic to use for parts to restore the project you already have, online salvage auctions are the answer. Quickly finding the classic car that meets your needs doesn’t have to be a challenge. After all, you want to spend time tinkering with the classic, not hunting high and low through classified ads and at car lots. With unified listings at online salvage auctions, classic used cars for sale can easily be found on your time and on your schedule. No matter the make or model you desire, a variety of classic used cars for sale can be found through online salvage auctions. Whether you want to find a classic Oldsmobile to trick out with lifts, hydraulics and spinners or find a Studebaker, Plymouth, BMW, Jaguar, Toyota or Ford to restore to its former glory, they are readily available. Finding parts for a classic car or finding a classic car to restore doesn’t have to bust your budget. Many of the vehicles available at auction go for bargain-basement prices while only having normal wear or minor dents. When you pay only what you can afford, you won’t mind handling a few scratches or pulling useful parts from a salvage vehicle. Start living your dream. 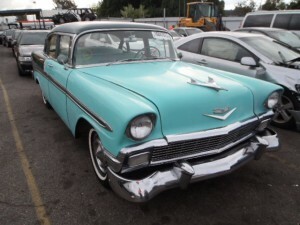 Sign up today and find the classic used cars you want for your next project at SalvageAutosAuction.com.